The American Conservative Union Foundation (ACUF) has just released its 48th Edition of its annual Ratings of Congress. The guide ranks members of Congress based upon their commitment to conservative principles as demonstrated by their voting records in the 2018 session of Congress. These Ratings of Congress—and our Ratings of all 50 state legislatures—are initiatives of ACUF’s Center for Legislative Accountability. In all, every year we rate about 8,000 elected officials across 101 legislative chambers across the country. 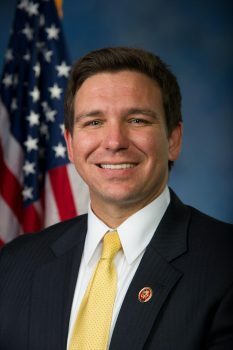 Florida’s other federal lawmakers received the following scores: Rep. Ross (78%), Rep. Tom Rooney (75%), Rep. Rutherford (68%), Rep. Buchanan (58%), Rep. Mast (52%), Rep. Diaz-Balart (46%), Rep. Curbelo (30%), Rep. Ros-Lehtinen (24%), Rep. Lawson (12%) and Rep. Murphy (12%). The following lawmakers qualified for ACUF’s “Coalition of the Radical Left” for earning scores of 10 percent or less: Sen. Nelson (10%), Rep. Crist (8%), Rep. Castor (4%), Rep. Demings (4%), Rep. Deutch (4%), Rep. Frankel (4%), Rep. Hastings (4%), Rep. Soto (4%), Rep. Wasserman Schultz (4%), and Rep. Frederica Wilson (4%). This year, ACU Foundation double-weighted the vote to confirm Brett Kavanaugh to the Supreme Court and another to re-impose government control of the internet. The percentage of Republicans earning awards for their conservative voting records fell compared to the 2017 session (from 66 percent to 55 percent). The average scores of Democrats was 10 percent in the Senate and 8 percent in the House. This session’s scorecard is made up of 25 bills in the U.S. House of Representatives and 20 bills in the U.S. Senate. The bills selected cover a wide range of issues including fiscal and economic, social and cultural, and national security, and are designed to reflect how lawmakers view the role of government in an individual’s life. ACUF hosts the Conservative Political Action Conference (CPAC), the largest gathering of conservatives in the world. They have for more than fifty years harnessed the collective strength of conservative organizations fighting for Americans who are concerned with liberty, personal responsibility, traditional values, and strong national defense.